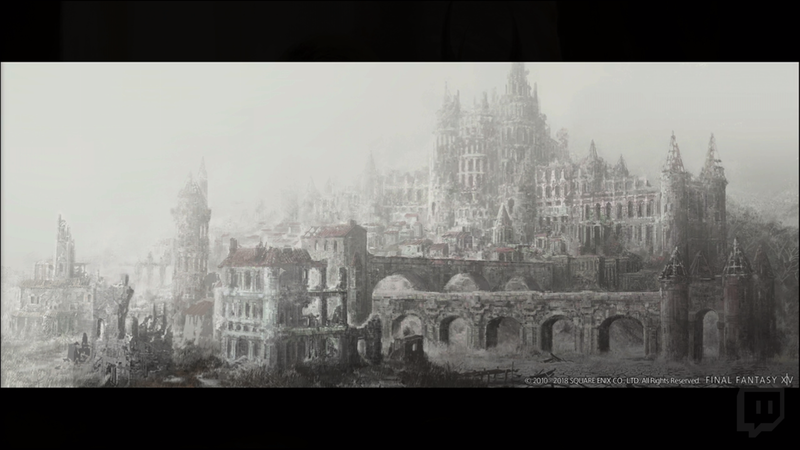 During the forty-seventh Letter from the Producer Live broadcast, Final Fantasy XIV producer/director Naoki Yoshida and lead battle designer Tsuyoshi Yokozawa took the stage to discuss Patch 4.5 and the new Blue Mage limited job. Part 1 will release in January and Part 2 will release in March. Other big items discussed are the World Visit system which will let you visit other worlds on your data center and the reorganization of worlds two accommodate two new data centers. We’ve summarized the highlights below. – The title of the Patch “A Requiem for Heroes” has several meanings behind it. It leads up to the ‘Shadowbringers’ expansion. – 4.5 will be split into two parts: Part 1 arrives in Early January 2019 and Part 2 arrives in Late March 2019. 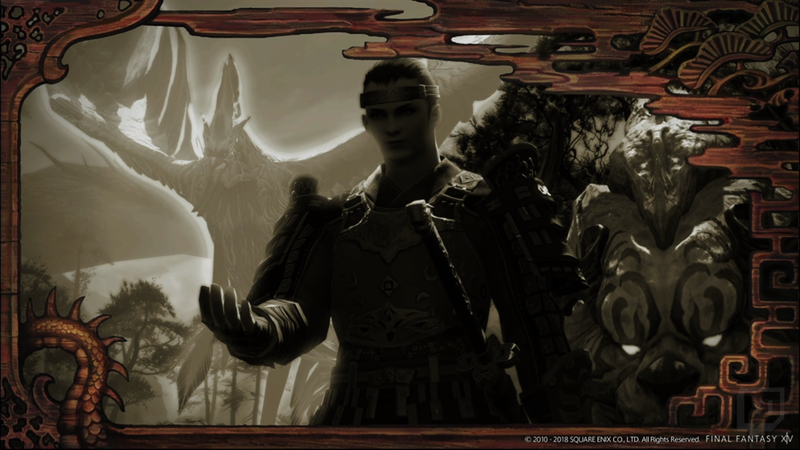 – New main scenario quests and screenshots were shared featuring Maxima conversing with Alisaie and the First Emperor of Garlemald: Solus zos Galvus. 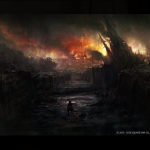 – Two new side stories will be added: the finale of the Four Lords and Even Further Hildibrand Adventures. 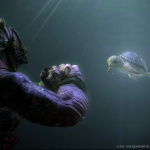 – Screenshots shown are a picture of Tenzen and Genbu conversing with Soroban. 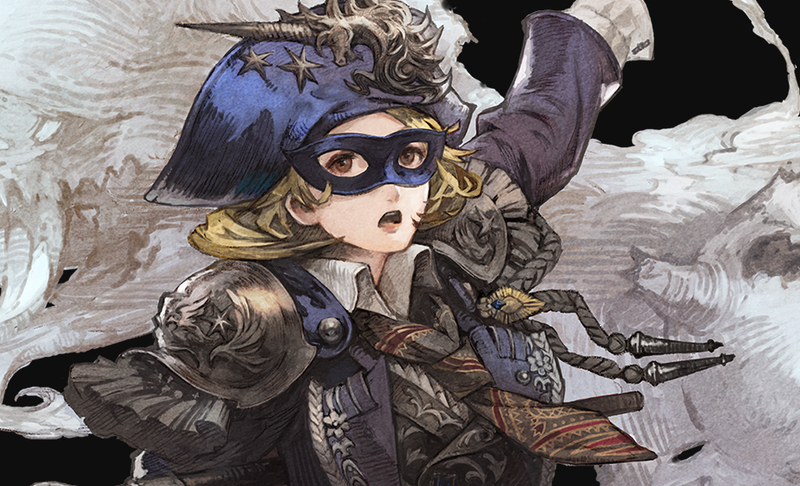 – Blue Mage will be added as a new limited job, along with a Blue Mage-specific duty The Masked Carnivale. 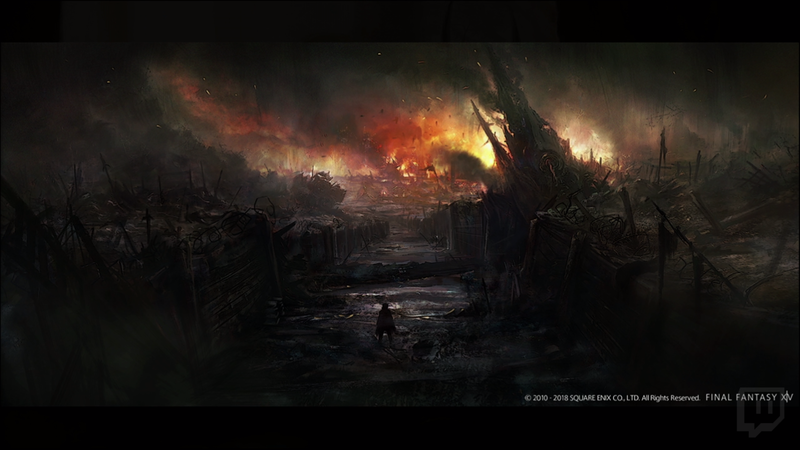 – The Ghimlyt Dark will be added as a new Level 70 dungeon – it is experienced through the main scenario quest. Main scenario characters will appear and have voice-over. 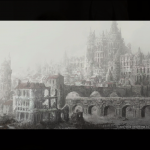 – The Return to Ivalice alliance raid will return with The Orbonne Monastery. 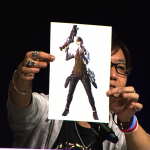 One of the reward sets is Balthier’s outfit from Final Fantasy XII. – When you beat the Four Lords and obtain all the dog mounts, you’ll be able to unlock a kyubi mount. 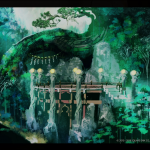 – The fourth installment of the Forbidden Land Eureka series will be the Hydratos Expedition. 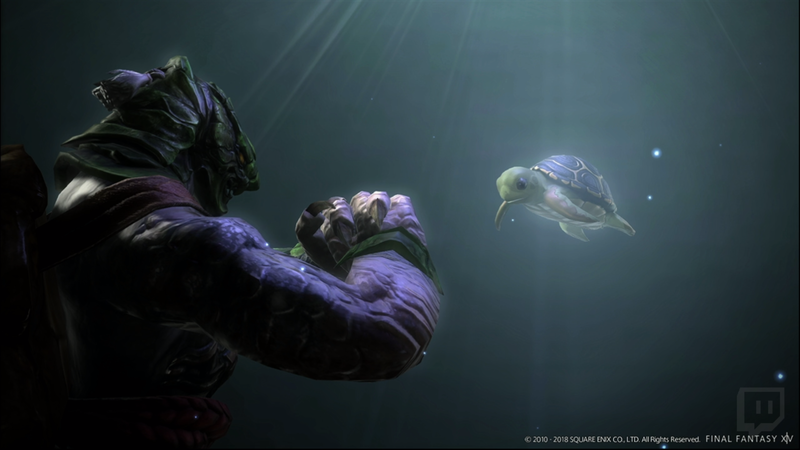 “Hyrdratos” named after the Greek word for water, this instance will be different than previous versions — almost like a public dungeon or raid. 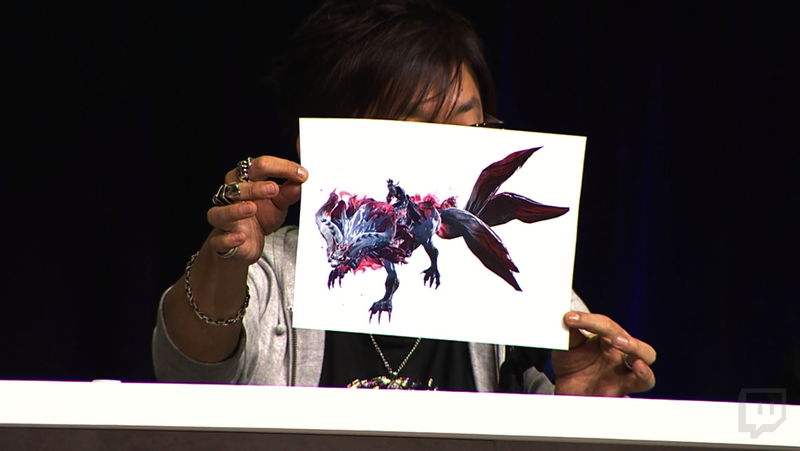 It’s unlike the content they have done before in Final Fantasy XIV. This content will likely be in 4.5 Part 2. 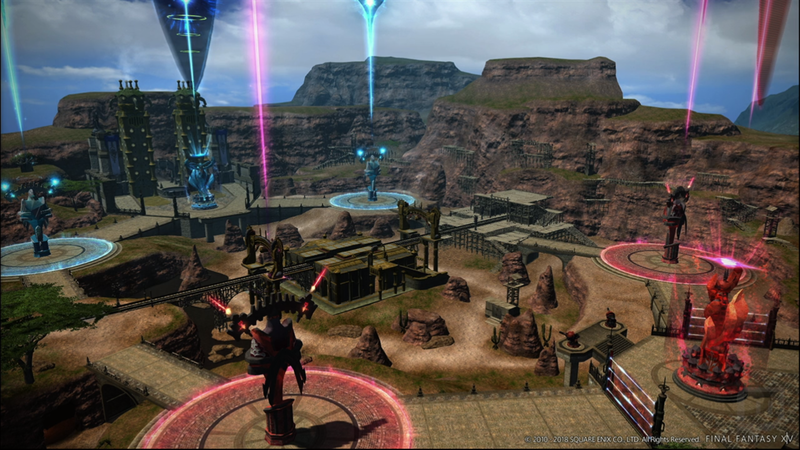 – PVP Updates will feature a new Rival Wings map: The Hidden Gorge. There’s a train that runs through it, should you be hit by it, it’s bad news. 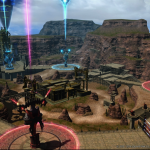 – A new large scale Gold Saucer mini-game will be added in Patch 4.5 Part 2. More details will come at the next broadcast in December. 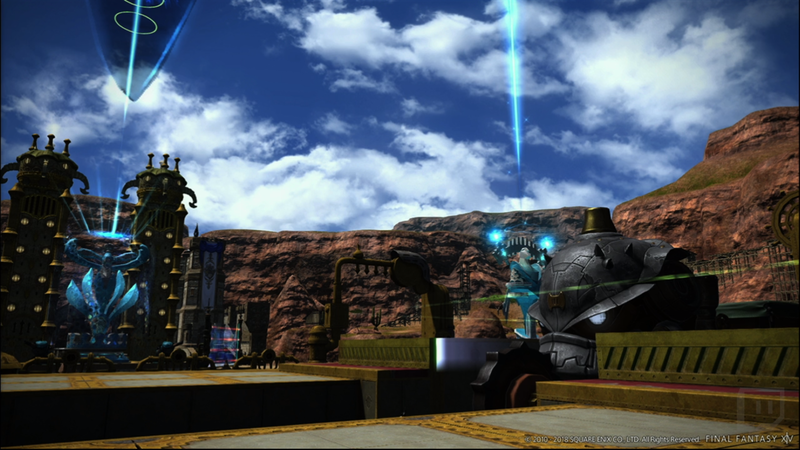 – A new GATE minigame in the Gold Saucer will be added called Air Force One. 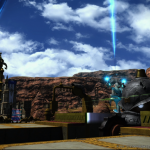 You might remember the Air Force mount in the Sigmascape raid… The mini-game is like a roller-coaster where you’ll need to shoot targets. – New Custom Deliveries will be added with a new client. 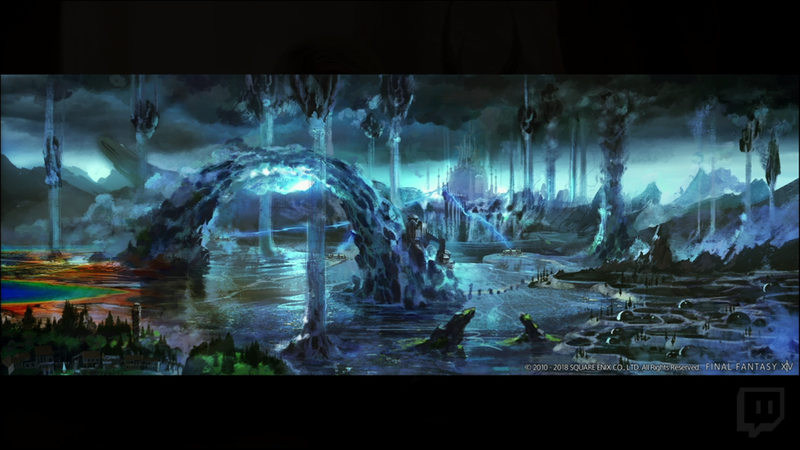 The World Visit system will be added towards the end of the Patch 4.5 series — the feature will let you visit other worlds in the same data center by utilizing the main aetherytes in Limsa Lominsa, Gridania, or Ul’dah. After selecting what world you would like to travel to, a Duty Finder-like window will appear that will prepare you for travel. 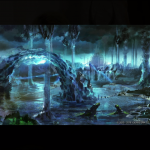 The Duty Finder chime will sound when the system is ready to transport you — then you will enter a load screen and eventually the same aetheryte in the selected world. Your current server will remain your ‘Home World’. There’s no time limit to stay in your Destination World — you can stay there indefinitely if you so choose. If you log out in a Destination World, you will return there when you log back in. There isn’t a limit to how many times you can travel to other worlds, but if the world capacity is full you may not be able to travel there. — Retainers cannot be hired or summoned. — Items cannot be put up for sale on the markets (but you can view and purchase items). The hope the pricing disparities between the worlds will disappear with this feature. Making a universal market board would need a very large revision, so this is the best that could be done. — Estate plots and apartments cannot be purchased (housing areas are accessible). — Most free company features cannot be accessed (chat is available). — Linkshells are not available (cross-world linkshells are unaffected). — Eternal bonding ceremonies cannot be scheduled or attended. — Unspoiled and legendary gathering points cannot be utilized. — Tickets for the Jumbo Cactpot cannot be purchased. — Lord of Verminion and Triple Triad tournaments cannot be entered. 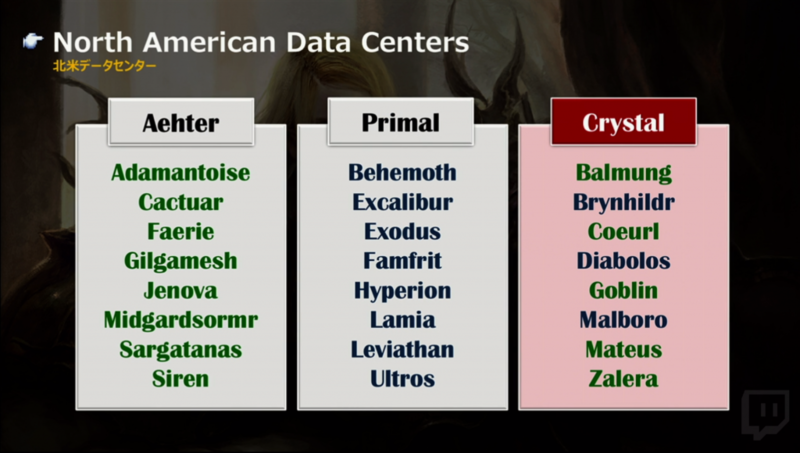 The Data Center Expansion will add a “Crystal” data center for North America and “Light” for Europe. The team thought long and hard about coming to this decision but it was made for the health of the game going forward so that as the game grows they can accommodate higher populations. 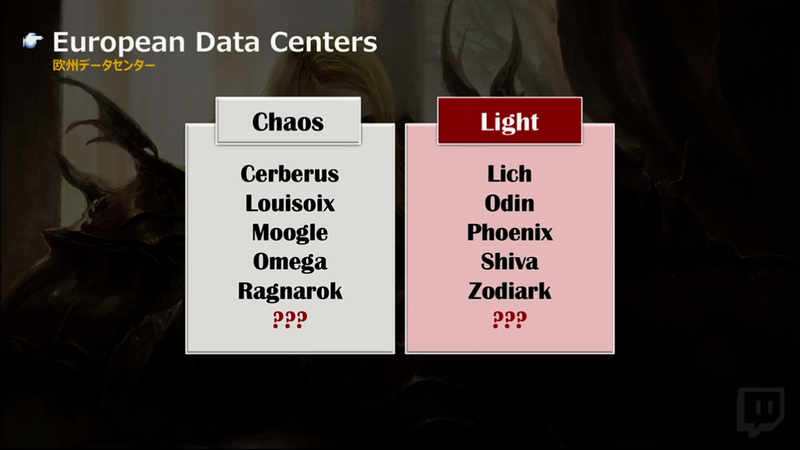 Redistribution is scheduled to be carried out over a two week period, during which all characters from Worlds within affected Data Centers may use the World Transfer Service free of charge. — The maximum gil that may be retained by a player transferring to another world will be increased to 999,999,999. — Players who own estates will be reimbursed the full 100% of the original purchasing price of their plots. These players will also receive an additional 3,000,000 gil as compensations for furnishings lost in the process. — Players who own apartments will be reimbursed the original purchasing price of 500,000 gill as compensation for furnishings lost in the process. Lead battle system designer Tsuyoshi Yokozawa joins the panel to talk about the Blue Mage limited job being added in Patch 4.5. — In accordance with Final Fantasy tradition, this classic job “learns” new abilities from enemies and wields them against their foes as blue magic. 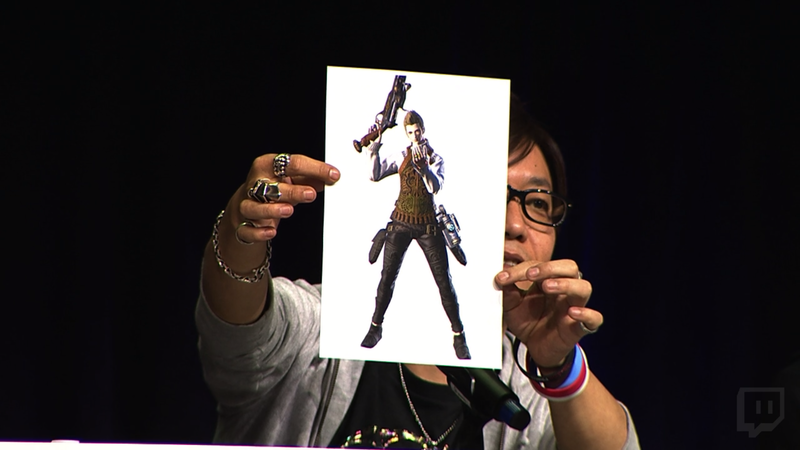 — The first limited job in the game has no base class and starts at Level 1. — The Blue Mage’s level will cap at 50 but will be raised later. 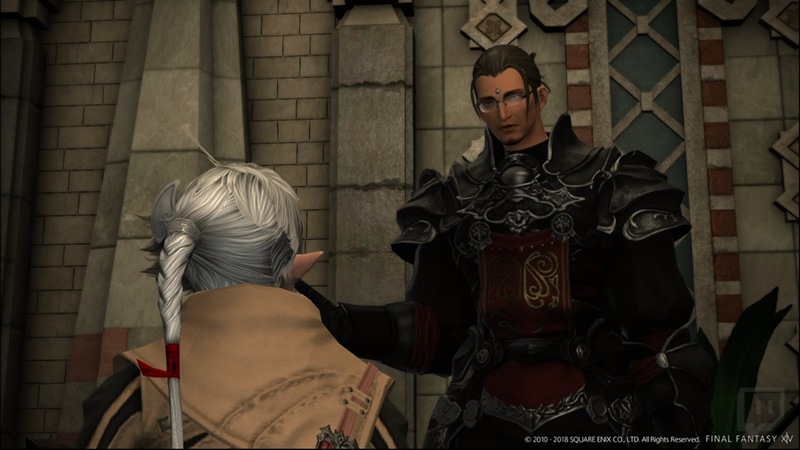 — A new job quest will be added on release of Patch 4.5. — Uses ranged magic DPS gear and role actions. 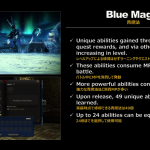 — To unlock the Blue Mage, you need to have a Disciple of War or Magic at Level 50, have the 2.0 main scenario completed, and purchase of the expansions is not required. 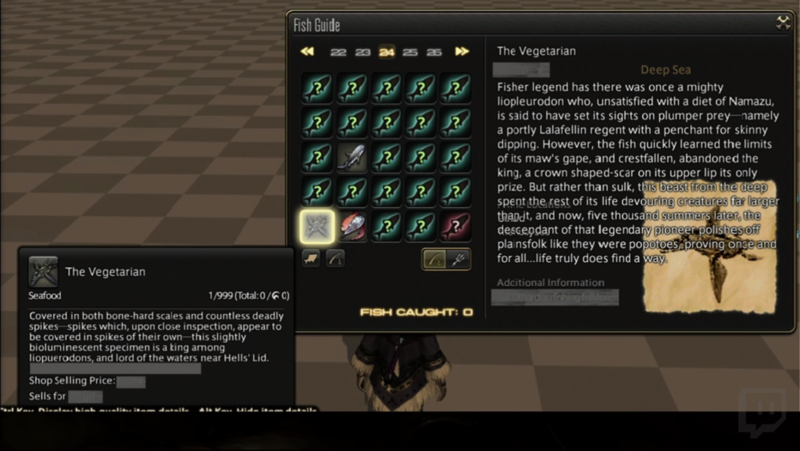 The first “Limited Job” in Final Fantasy XIV is designed for solo play and is not suited for parties. 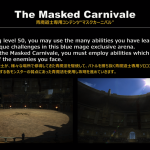 While Blue Mages can learn abilities while in parties, the Masked Carnivale can only be accessed by solo blue mages. 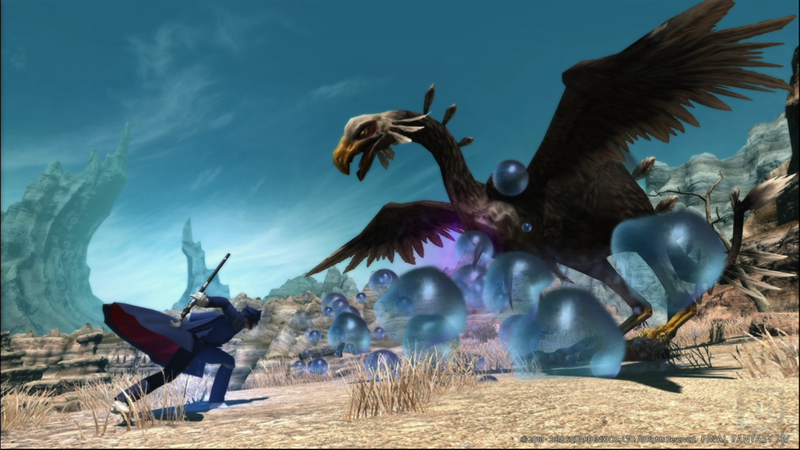 The idea of the blue mage is to learn abilities from monsters. Some of the abilities you can learn might break the game but that’s what makes the Job so fun. Why was this decision made for it to be a solo class? 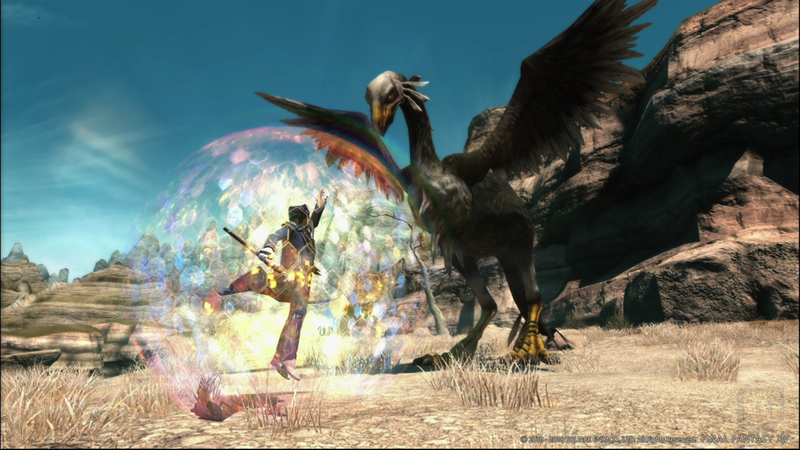 They wanted to preserve the Job’s idea of learning abilities from monsters, but in party content there might be situations where a Blue Mage would be kicked if they had not learned certain abilities. If they were to add a “Level 5 Death” ability that many blue mages in the series use, it would break the balance. Should they make restrictions on the ability or duty? The team says that would take the fun out of playing this Job. 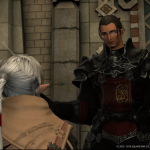 Previously Yoshida said this was the reason they would not add blue mage, but pressure from around the globe convinced them to take it in a new direction so they could have it in the game. This kind of limited Job system could open up other opportunities for classic Jobs that don’t fit the mold of Final Fantasy XIV. Hypothetical limited jobs could be Beast Tamer? Puppetmaster? — Other duties not listed bay not be accessible by blue mages. 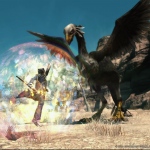 Blue Mage progression will involve fighting enemies in public areas. Defeating monsters has a different EXP curve for Blue Mage. A new calculation formula for the experience points had to be created in which Yokozawa says was really tough. You can also pre-form parties and undertake instance duties but duty roulettes are not an option. 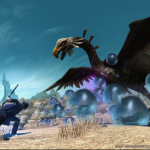 Blue Mages will gain more experience defeating enemies in public areas. 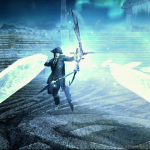 Upon attaining level 50, you may use the many abilities you have learned to undertake unique challenges in this blue mage exclusive arena. 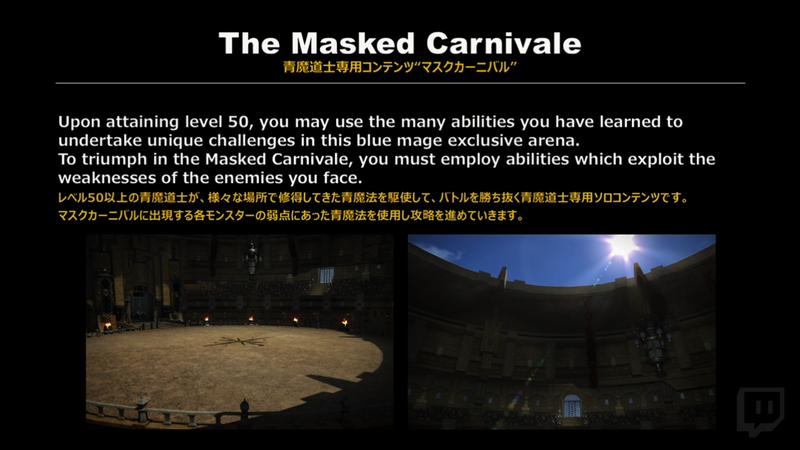 To triumph in the Masked Carnivale, you must employ abilities which exploit the weaknesses of the enemies you face. The abilities you use will have different properties like elemental properties that you will need to use. The point is to find out which abilities, or combination of abilities, will get you to think on what is best to use. Each entry will consist of three rounds and there are 25 different encounters in each of the three rounds. If you don’t have the blue magic required you’ll either need to go get the magic or figure out how to complete the stage with the magic you have. 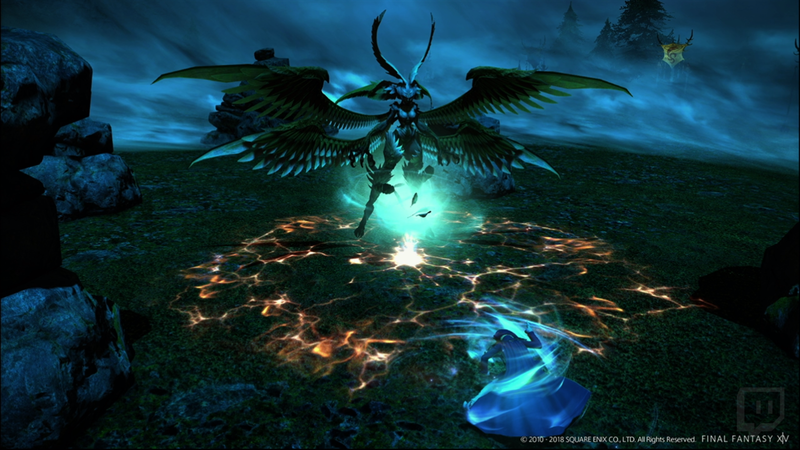 For example, usually bird monsters in Final Fantasy games are weak to lightning — this is the type of properties battles in the Masked Carnivale will have. Some of the different magic includes a cactuar’s ‘1000 Needles’. To learn an action, you need to ‘see’ the action but you don’t have to be hit by it. For a morbol’s ‘Bad Breath’ you don’t have to sit in the AOE marker and suffer the status effects. You can learn an ability from Shiva too. By defeating enemies after witnessing them performing certain techniques, blue mages may “rarely” learn new abilities. How rare? The team says when you see the Action Learned” text on the screen it’ll feel like an exciting moment. Unique abilities gained through combat, as quest rewards, and via other means, not by increasing in level. These abilities consume MP upon use in battle. More powerful abilities more MP. Upon release, 49 unique abilities can be learned. Once they raise the level cap, there will be an increase in the amount of abilities there are. Up to 24 abilities can be equipped. 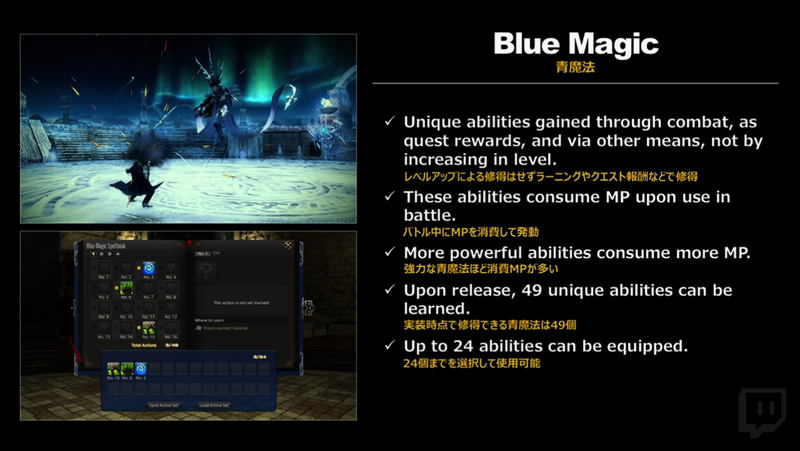 The abilities will be recorded in a Blue Mage Spellbook. When you hover over an empty entry, you will see the location of where to find it — therefore you’ll have to predict and work with the community to find where it could show up. For some duties, you could queue as or with a Blue Mage to help them learn an ability. Other blue mage spells include: ‘Eruption’, ‘Mighty Guard’, and ‘Aqua Breath’. The tank’s level 2 limit break has been changed to ‘Stronghold’ to acommodate this. — The next two Fan Festivals will be in Paris in February and Tokyo in March 2019. — The SDS Fenrir mount and Tifa minion are now available for purchase on the MogStation. — Encyclopedia Eorzea Vol II will go on sale Saturday November 24th. A second printing is planned. — THE PRIMALS Zepp Tour 2018 -Trial By Shadow- Blu-ray disc is available on February 6th, 2019 for $54.99. Includes English subtitles and orchestrion rolls for Oblivion (GUNN Vocals) and Rise (THE PRIMALS). Back from Fanfest, and man, what an exciting rush of information! 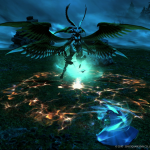 Blue Mage, the ideas for the new expansion, and all the fun moments with Soken! This was so awesome this time around, can’t wait for 4.5 to come! People are jaded, and somewhat rightfully so, that it isnt an actual job they can main for main-game content in conventional means. But they forget that if it was implemented as a classic job it would lose part of what makes blue mage well…blue mage. 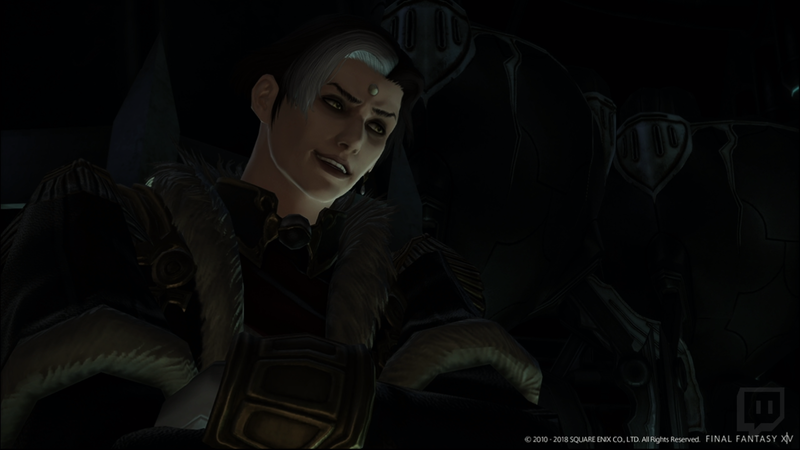 Talking about the gunblade thing withThancred? All I care about is story and dungeons and gear. I’m pretty much done switching classes. I play 3 dps and that’s it. Some people play everything but not me. In not into makes that much. So if people want to complain it does matter because no class stays the same forever. They can wait for change or ignore the class altogether. That simple. I think it’s a case of being over thought. He could simply have picked it up and used it. Doesn’t mean HE uses the class. But I bet the warriors of light (players) will be able to once the infiltrate Garlemald. Are you playing during this free month time slot they’re doing now? 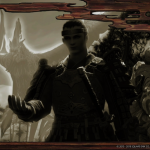 I’m trying to get to storm blood but I only recently finish heavensward and now am starting dragon song. I just can’t rush the story. But I do rush thru anything goblins say. Did they say anything about finally adding FF7 stuff to the game? And I don’t mean mounts and minions. I mean bosses and dungeons. i think they could have included BLU into regular duty finder if they changed the party system up a little bit.. instead of 4 person raid, make it 5 person with the 5th slot being a wildcard with a couple of new classes similar to blue mage that dont fit any specific role. like add a beastmaster where different beasts can serve different types of purposes.. so you still have your 1 tank, 1 healer, 2 dps, but add that 5th wheel. so if you get a wildcard blue mage with a lot of healing skills, they could act as a backup healer, or a dps or whatever, just dont make them as powerful as a job that is solely dps for example, but you could still do the content with 4 people. if you happen to get that 5th it would be a bonus.. maybe increase the difficulty of the mobs slightly when that 5th member is with. im a fan of unpredictable situations. once you run a dungeon, its the same thing every single time after that with no variation other than maybe getting some first timers in there that are still learning. 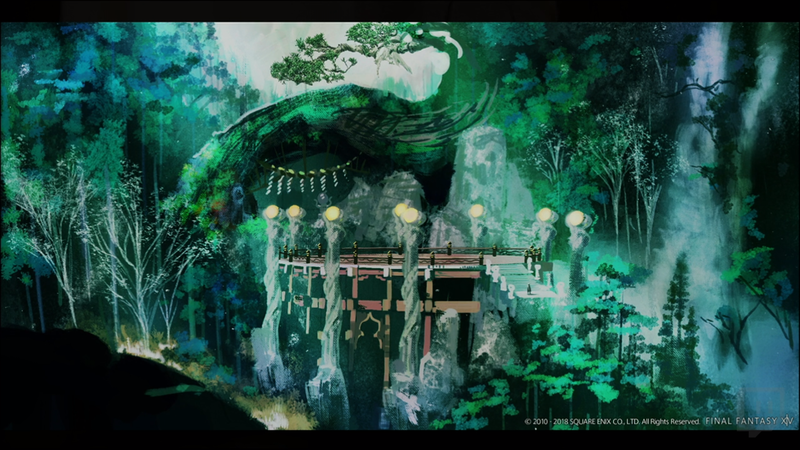 Except they said that there was a newclass that we saw in the trailer O.o and we already have SAM…. No no no. I know there’s the gunblade class coming from that info. But I doubt THANCRED will be one. I’m still subscribed, as I have always been since launch. Don’t rush my man, enjoy the game lol. Don’t blame yeah for skipping Alexander’s story, since it’s hot garbage imo. Also nope, no FF7 anything. All you saw through live streams was what they only announced. 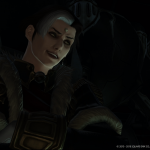 Thancred will not be the job giver, since they tend to avoid Scion characters doing that. 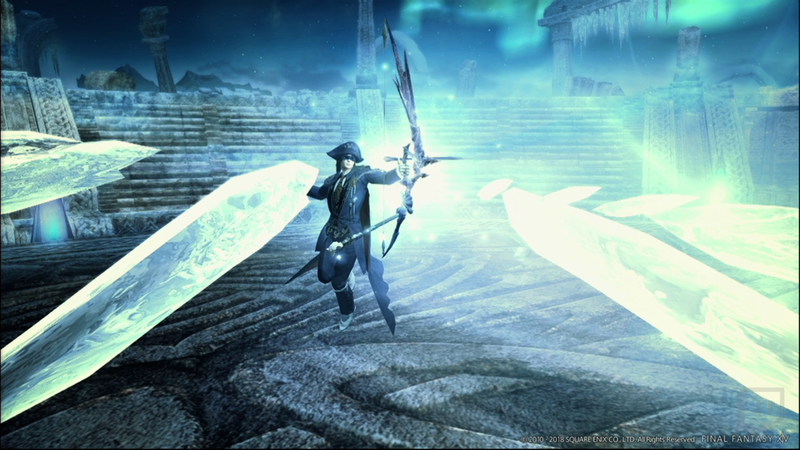 However, Thancred is obviously a Gunblader now due to his aether connection being severed. Why are the avoiding FF7 other than a mount? Thats not a job, thats a class. I’ve seen him use healing too.and paladin attacks. That doesn’t mean he doesn’t have a class or job. As far as I’ve seen they make him whatever they want him to be at the time. Probably to mimic the WoL constantly changing their jobs . After all the burden of proof isn’t on me to prove. I know what I’ve seen. LMAO when it comes down to it if he gets a gunblade it’ll likely only stick around until he switches to something else they feel like promoting. That’s the trend they’ve gone with with him. When ninja came he switched to that. They they made him look more badass and now they want him with a gun blade. Shrugs. Oh well. If they feel like it he’ll be whatever comes after that. “When ninja came he switched to that” – when wasn’t he a rogue? 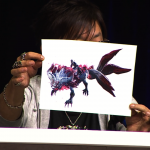 Already multiple bosses of VII were reused in XIV, you should simply be more focused. You surely have not played all the stormblood dungeons yet. Just got to the SB chapters today. Which ones, all I heard about was Omega putting chaos, kefka, and exdeath in the game.